As early as the first few months of life, hearing ability is crucial for development in children, especially in the areas of language and speech. Until recently, hearing issues in small children went largely undetected until the age of two years old–and this only when the child failed to begin talking on a normal schedule. Research has indicated, however, that if hearing loss can be detected prior to six months of age, the child will have a much better chance of developing normally than if it is detected later. Now it is common practice in hospitals around the country to conduct infant hearing screening, and hearing loss has been treated and arrested at much younger ages than before. 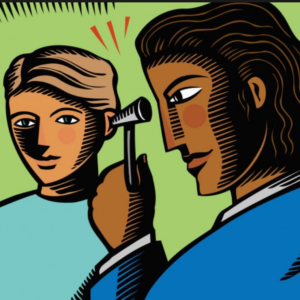 Is Childhood Hearing Loss a Big Problem? Hearing loss in infants is rare, but not as rare as you may think. Data indicates that out of every 1000 newborns, an average of 1.4 have hearing loss at birth. In older children, between the ages of three and 17, studies by the CDC have shown that about 5 out of every 1000 children suffer from hearing loss. Children have been exposed to more excessive noise in the environment, which is the main cause of hearing loss in children. Unfortunately this damage to hearing is permanent, so the only current solution for noise-induced hearing loss is prevention. What Causes Childhood Hearing Damage? Besides noise-induced hearing loss, there are other types of hearing loss with various causes. And hearing loss can be conductive, sensorineural or mixed. Whatever the cause or type of hearing loss, it is important for parents and other caregivers know the signs so hearing loss in children can be halted and treated as soon as possible. Undiagnosed hearing damage can cause emotional and developmental issues in young children. Congenital hearing loss is damage that was already present at birth. Causes can range from genetic and non-genetic factors, and are not always easy to identify. Non-genetic factors can include birth complications, viruses and infections, or lack of oxygen during birth. Premature babies can also be at risk of hearing loss because of medications they may be given to help with respiration and other life-sustaining measures. Brain disorders and nervous system issues can also result in hearing damage, as can the use of over-the-counter pain medications by the mother during pregnancy. Maternal infections, diabetes, smoking or alcohol abuse during pregnancy can also cause issues. Genetic factors are responsible for at least half of all hearing damage in children, no matter what the age. They include autosomal recessive hearing loss–resulting in a recessive gene carried by both parents, or autosomal dominant hearing loss–in which one parent carries a dominant hearing loss gene. Other genetic causes are syndromes such as Usher, Treacher Collins, Waardenburg, Down, Crouzon and Alport syndromes. Hearing loss can also be acquired, caused by various factors. These may include exposure to loud noise, untreated ear infections, second-hand smoke, head injuries, over-the-counter (ototoxic) medications, a perforated ear drum, infections such as meningitis, measles, mumps or whooping cough, or other diseases. Middle ear infections can also cause transient hearing loss, which while temporary, can interfere with development as well. Most hospitals perform hearing screening on infants within hours of birth, but sometimes hearing loss is not detected or it is developed later. If you suspect your child has an issue with hearing, have him or her screened by a pediatrician soon. Watches a speaker’s face very intently – many children’s hearing loss escapes detection because they are very successful lip readers.